The show begins with the death of Eleanor Shellstrop (Kristen Bell), a selfish 35-year-old snake oil sales rep from Arizona who immediately knows something is awry when she finds herself in the titular utopia rather than its Hadean alternative. 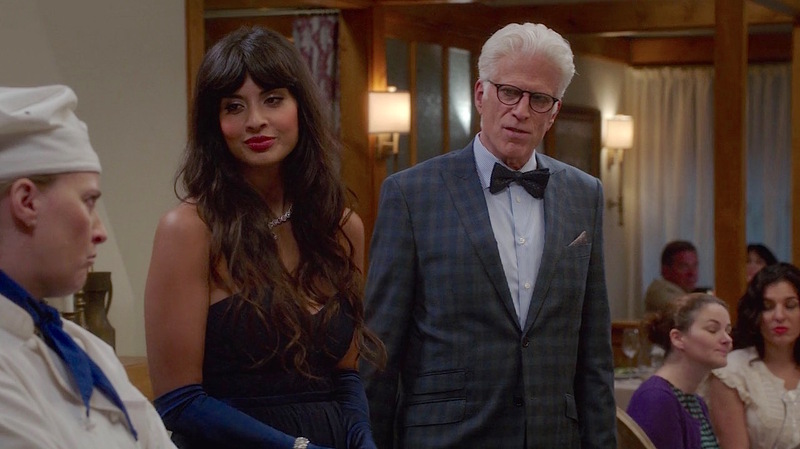 She is welcomed by the immortal Michael (Ted Danson) who is eager to show Eleanor the ropes of her new post-life life. Unfortunately, Michael’s carefully planned neighborhood begins rebelling against Eleanor’s unnatural presence, including a vast sinkhole that ruins the opening of new restaurant The Good Plates (do you get it please? 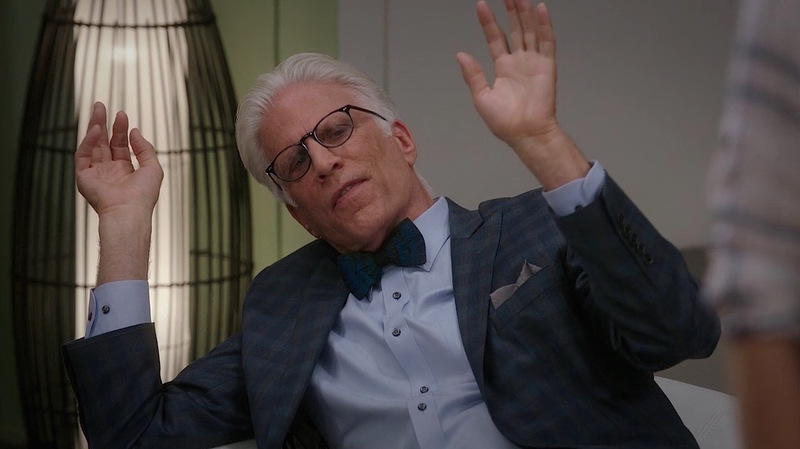 ), forcing Eleanor to admit to Michael and the rest of “the good place” that she doesn’t belong. So what does this already colorful dresser consider to be his “jauntiest” suit? Michael holds court at the opening of The Good Plates in a navy, teal, and taupe plaid suit. 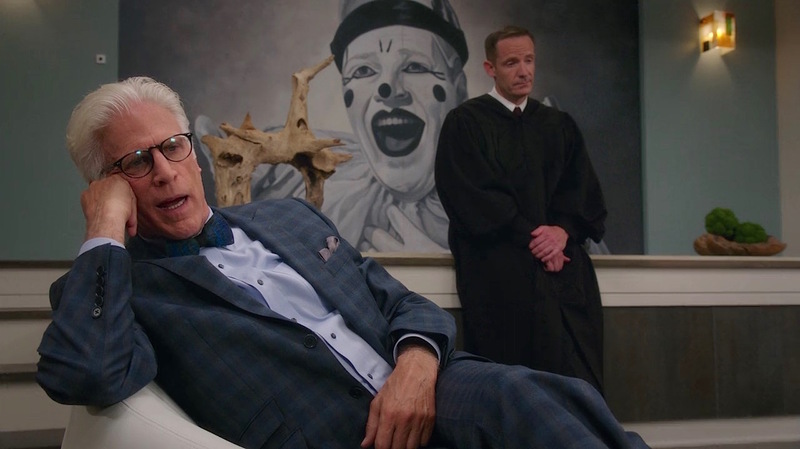 Michael, busted in front of his boss (and a somewhat horrifying clown). Michael wears a variety of styles for his suit jackets and sports coats, but this particular single-breasted suit jacket has sharp peak lapels – with a buttonhole through the left lapel – that rolls to the top of a two-button front. He has several other plaid suits, but this is his only jacket with peak lapels… possibly the element that marked it for selection on this most festive of occasions. 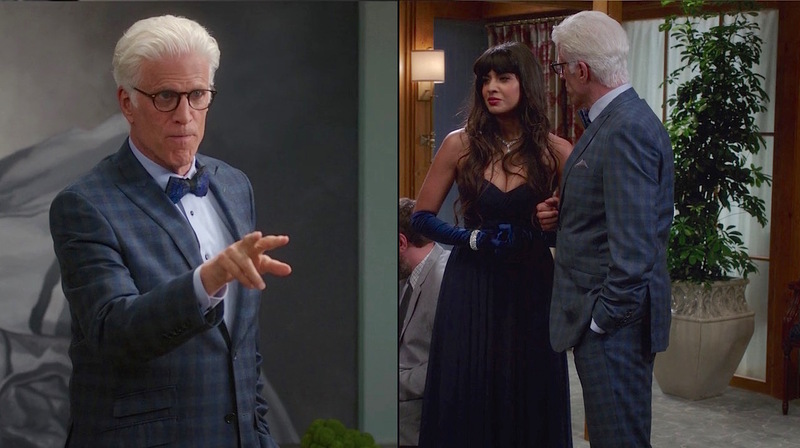 Tahani (Jameela Jamil) and Michael (Ted Danson) dressed in their fineries for the opening of The Good Plates in “Jason Mendoza” (episode 1.04). The long double vents allow Michael to place his hands in his pockets with minimal interruption of the suit’s flow, and his sleeves are loaded with five buttons at the ends. Jaunty indeed. The flapped pockets on his hips slant gently toward the back, as does the smaller flapped ticket pocket that runs parallel above the right-side pocket, positioned between the two buttons on the front of the suit jacket. Around Michael’s neighborhood, this serves as the ideal business suit. In this suit jacket’s welted breast pocket, Michael always wears a gray silk pocket square worn folded into a single point (for the restaurant opening) or dual points (for the final three episode arc of “saving” Bad Eleanor.) Though there is a subtle, spaced-apart series of gray-stitched paisleys scattered on the silk pocket kerchief, the overall effect is understated enough to add luxury – rather than chaos – to an already busy ensemble. The suit has flat front trousers with a fitted waistband, side pockets, and plain-hemmed bottoms. 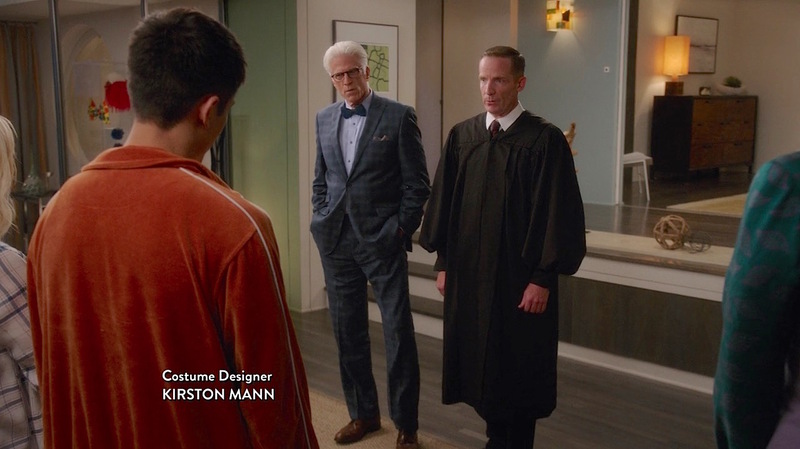 This screenshot from the beginning of “Michael’s Gambit” (episode 1.13) also includes Kirston Mann’s costume designer credit. Michael looks forward to sporting a pair of suspenders at the restaurant opening in “Jason Mendoza” (episode 1.04), referring to them as “one of the human clothing items I’m most eager to try.” In fact, he talks himself into being more excited – well, “cautiously optimistic” – about the suspenders than about the party itself. “Check it out! So dumb… so much dumber than belts,” he laughs as he shows off his blue paisley suspenders with their silver-toned hardware. Michael fulfills his dream of wearing suspenders. At the restaurant opening in “Jason Mendoza” (episode 1.04), Michael wears a blue-and-white bengal-striped cotton shirt with a large spread collar, plain front, and adjustable-button barrel cuffs with mitred corners. Michael’s sparkling navy bow tie is also appropriately festive for the occasion, likely pre-tied in a large butterfly/thistle shape. 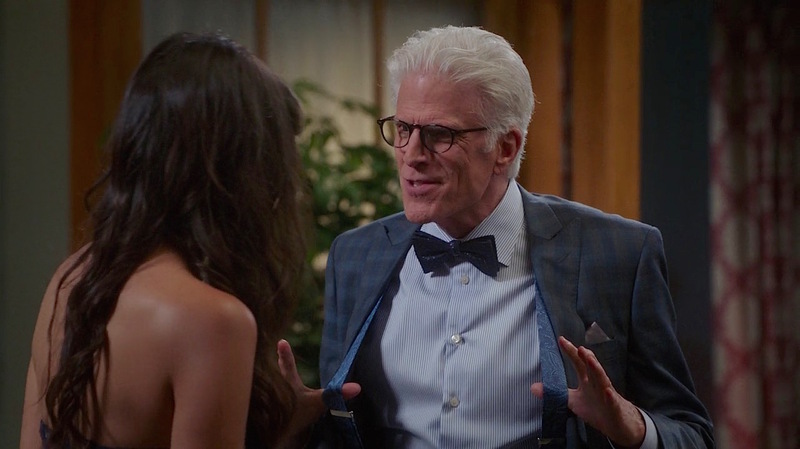 For the suit’s next appearance at the beginning of a three-episode streak, Michael has not only abandoned the suspenders (and goes sans belt), but he has also changed into a different shirt and bow tie. Beginning in “What’s My Motivation” (episode 1.11), Michael wears this suit with a light blue cotton poplin shirt, a strong choice for coordinating with the navy tones of his suit while the solid fabric is also less likely to clash with the plaid suiting. Like the striped shirt, this shirt has a spread collar and adjustable-button cuffs though these are rounded rather than cut with mitred corners. This shirt also has a breast pocket and a front placket with smoke-gray plastic buttons. Michael admits defeat in “Michael’s Gambit” (episode 1.13). 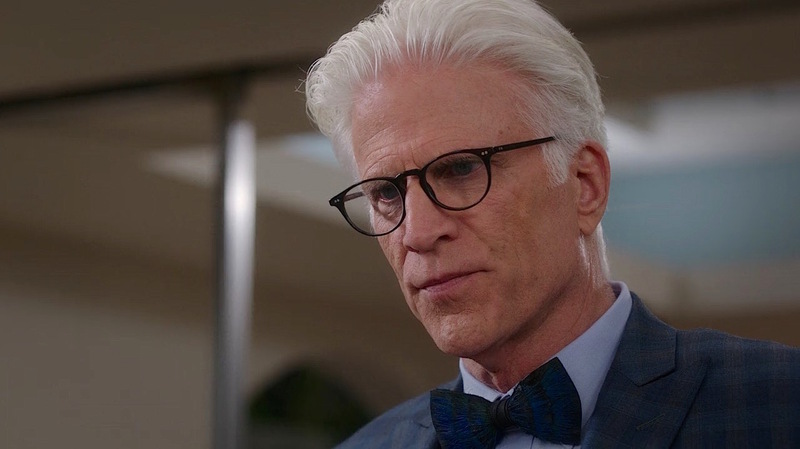 Like the distinctive peacock-feathered bow tie that Michael wore in the first episode, his bow tie in these final three episodes of the first season was made from bird feathers. Both bow ties are products from the Charleston company Brackish, founded in 2007 when Ben Ross handcrafted a set of turkey feather bow ties for the groomsmen in his wedding party. Ross and one of the groomsmen, Jeff Plotner, then co-founded the company that continues to make one-of-a-kind bow ties, handcrafted locally in South Carolina by a team of 50 artisans. 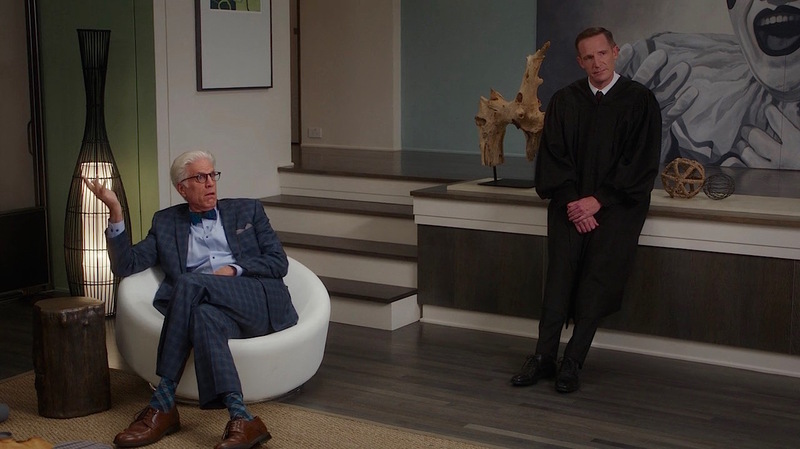 Ted Danson and Kristen Bell on the set of The Good Place. 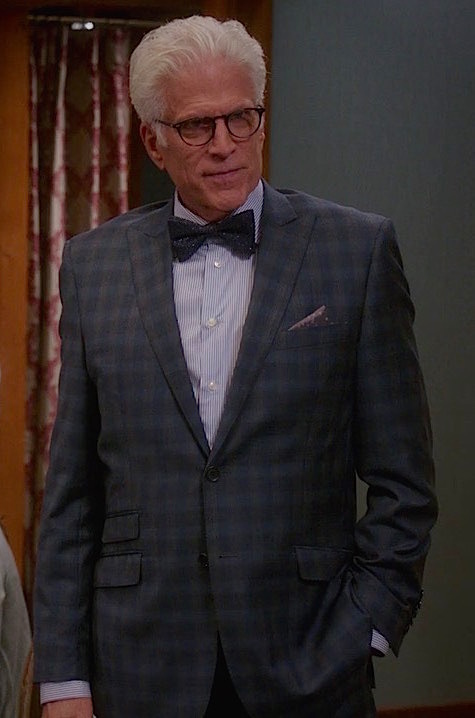 Danson wore the Brackish “Midnight” bow tie with this suit during the final episodes of the first season. I didn’t quite know how to play Michael until I went into the wardrobe department. The costume designer for the show said, “You may want to look at these,” and she brought out some bow ties made out of peacock feathers. Michael wears bow ties, and when I see a bow tie on somebody, that person is a certain way in my mind from then on. It is such a defining little article of clothing. 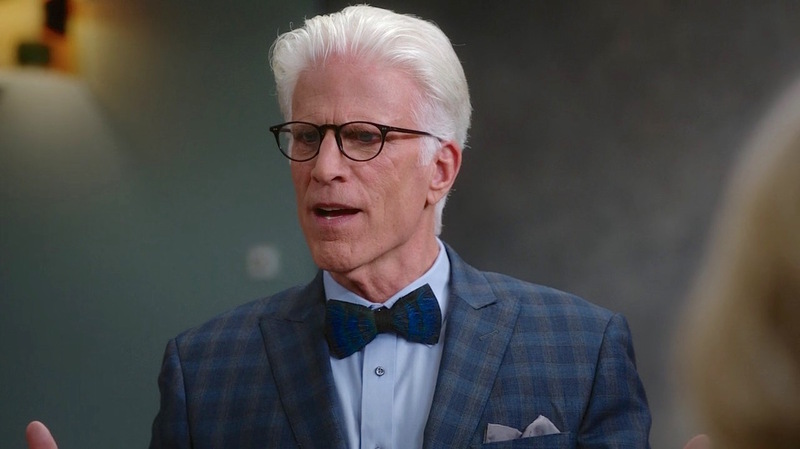 In these episodes, Michael wears a Brackish “Midnight” bow tie, made from turkey feathers in muted shades of blue and green (on black) that coordinate with his suit. 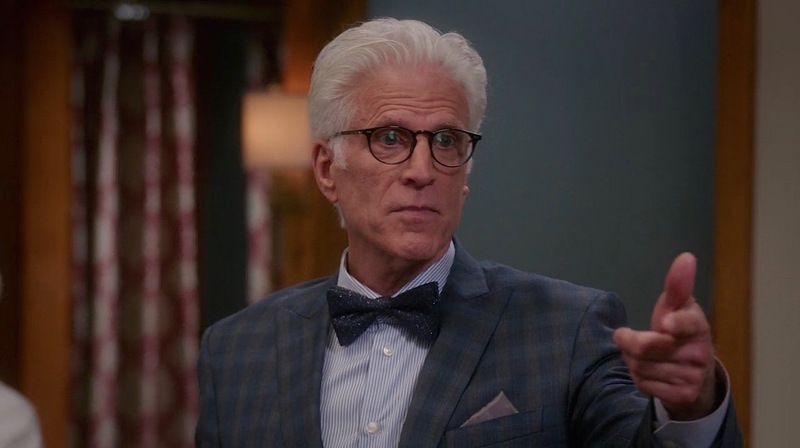 This particular bow tie had also appeared with Michael’s blue-on-charcoal windowpane suit in the third episode. As of April 2018, Brackish still offers the Midnight bow tie for $195. The bow tie is pre-tied in a large butterfly/thistle shape that is 2.5″ tall and 4.5″ wide. Michael channels a “Kristen Stewart on a red carpet level of emotionless” when pleading Eleanor’s case for Shawn in “Mindy St. Claire” (episode 1.12). An interesting dresser like Michael opts for color when he can, so he almost always wears brown rather than black shoes. His bicycle-toe derby shoes with this suit have four lace eyelets. For a similar pair of shoes, check out the Allen Edmonds “O’Hare” bicycle-toe derbies in walnut brown, currently available as of April 2018 for the close-out price of $197. One of the most commonly agreed-upon rules of menswear is to match one’s socks to his trousers. With a tri-toned plaid suit like this, it would have been easy enough for Michael to find a pair of navy socks that would work to the same effect, but he goes the extra yardage and sports a characteristically natty pair of navy, teal, and gray plaid socks. 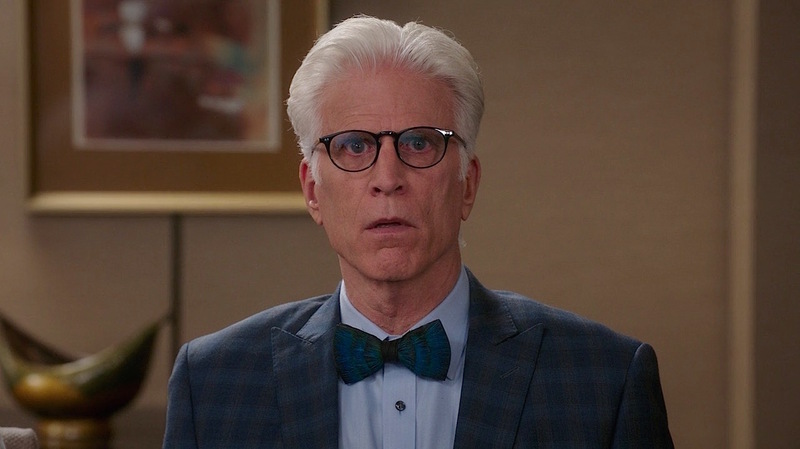 In addition to featuring on The Good Place, this black OP frame appears to be Ted Danson’s eyewear of choice in real life. 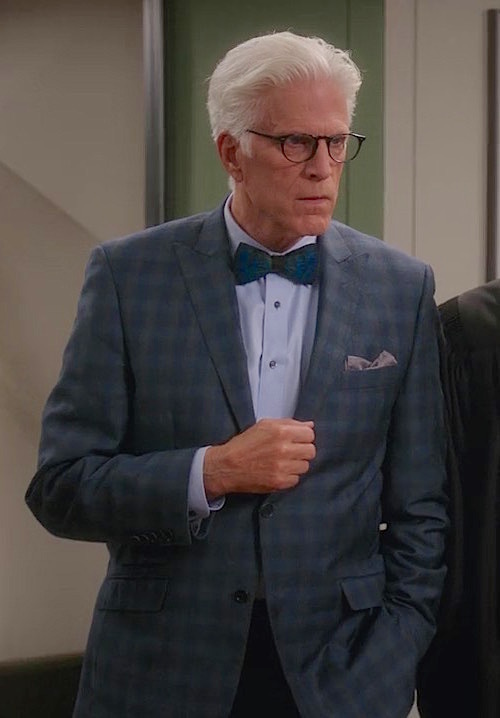 Michael wears the same suit, pocket square, and shoes described here, but this earlier episode features a blue bengal-striped shirt and a sparkly navy bow tie… slightly different from the solid light blue shirt and peacock bow tie worn in later episodes. The second season DVD will be released on July 17 this summer, the day before series star Kristen Bell’s 38th birthday. Now, you two sit tight. I’m gonna go murder Janet, and I’ll be right back. No wristwatch in the afterlife? That’s my idea of hell. I had a suit very similar to that one back in ‘86. Although mine had a more purple/violet hue to it. It was the Eighties, after all. Agreed, haha! What was your timepiece of choice in 1986? Back then, I didn’t know where to find a second-hand Rolex dealer. Of course, if I had just picked up the Yellow Pages, I would have probably found one or two. Ahh well, sadder but wiser. It was 1986, remember. I was more concerned with decent hair gel, baggy, pleated trousers and shiny mohair jackets, Spandau Ballet/Ultravox 12″ singles, and girls. Based on the overall cut, whimsical suiting, slim details, peaked lapels, and hacking pockets with ticket pocket, my guess would be that the suit is from one of the more quirky high-end British tailors, like Paul Smith, unless the suit was created within the costume department of the show as an original piece. Is there ever a view of the lining? Paul Smith tends to different cloths for each lining panel, in bold solid colors.